Startup makes end-of-arm tooling modular and interoperable with ROS 2.0 speaking robotic components. Startup Acutronic Robotics, created through a strategic investment between Sony and Acutronic, recently announced creating modular characteristics for three of Robotiq’s adaptive grippers through the use of the robotics operating system, or ROS. Modular versions of the Robotiq Hand E, 2F-85, and 2F-140 models, ranging from 50 mm to 140 mm stroke, are now all available for customers through Acutronic Robotics’ website. 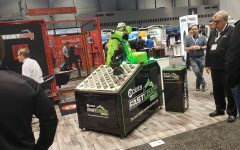 Acutronic Robotics said it used its cutting-edge H-ROS Technology to further pave the way for a more flexible automation. “Modularity reduces system integration efforts, one of the largest bottlenecks in robotic development,” the company said in a statement. By modularizing robot parts, developers can build, extend, and repair robots more efficiently. Acutronic’s adapters and modular grippers can help make end of arm tooling more modular. For customers that already own a Robotiq gripper, the company has launched an “add on” solution called the Modular Adapter. The device is an independent coupling that can make any of the three adaptive grippers modular and ROS 2.0 native. The Modular Adapter can attach to the grippers through an Ethernet connector, Acutronic Robotics said.